Elements applied: The main part of this plant applied as a treatment is the bark of its root. Acanthopanax is applied as a diuretical remedy, and used to improve blood circulation in the body. The plant has so far been linked with Siberian ginseng, and the main purpose of its use is to improve blood circulation in the organism. Helps one to get rid of excess liquid in the body. Commonly applied as a supplement to boost organism development in the early years. The plant is also known to relieve a patient of rheumatism induced by moisture and cold air. The herb is potent of strengthening bones. 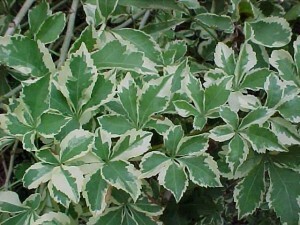 Still, the main spheres of its use are those of diuretical origin and blood circulation boost. The commonly used dose is 7 grams on average and up to 12 grams. 30 grams of herb extract is poured into a half a quart of strong alcoholic liquid (e.g. vodka). Applied as a treatment in a dose of one teaspoon three times per day. If ovary dysfunction takes place, accompanied with hot flashes, the plant should be avoided.